In this article we are looking at one of the foundations of shooting, literally, when we talk about the Correct Shooting Stance or how to stand when preparing for shooting. A solid trap shooting stance, or a proper shooting stance, is absolutely vital because you are creating a stable platform from which your good shots will come. A shotgun shooting stance is different to a pistol shooting stance or any type of handgun shooting stance. You wouldn’t think there was so much involved in setting up the correct shooting stance. proper shooting techniques, however we are looking predominantly at clay shooting techniques. Good shots usually look good because the shooter is relaxed and balanced. On occasion, one sees shooters doing all sorts of strange things – standing with legs feet wide apart, leaning back or too far forward. The there are those who crouch and sticking their rear ends out. Unfortunately as with other sports successful people set trends but sometimes these trends demonstrate the worst techniques. I am a believer in what looks wrong probably is wrong. However tension is always the enemy of good shooting. So, how do we adopt a correct stance? To be perfectly honest there is no single right way. Your stance, indeed, the whole way you address the target, needs to suit your body type and shooting style. A good shooting stance provides the platform for a consistent, unimpeded swing. More importantly, a good shooting stance provides good balance and control throughout the swing, but most importantly at the point of firing. Just remember your stance should be comfortable and natural to adopt. By all means take general hints from the set up and standing position from others but adapt these to suit you. When you look at people clay shooting, you will often see that they are off balance, nearly throughout the whole shot procedure but especially at the moment that they pull the trigger. A typical fault is to position the feet without allowing for any lateral movement during the tracking of the target. Those who set themselves up with their feet pointing towards the trap, will eventually run out of swing, lose balance, focus and come off line as they attempt to track the target. The result is usually a miss behind the target. Try setting up with the rear foot at about 90 degrees to your anticipated break point. This means you can easily and comfortably unwind into the target. There are a lot of other ways to stand. Many Olympians adopt a parallel stance. With this technique a straight edge across the toe tips and another across the heels they would be parallel. The there is the ‘modern stance.’ Where the front foot is positioned at a few minutes past twelve on the clock and rear foot just past two. The front knee is slightly bent, but the rear leg remains straight. Both feet may be kept firmly on the ground. The modern stance is particularly stable and gives a sense of being in control when conditions are not perfect. I tend to use it for very windy days as well as for domestic trap shooting. 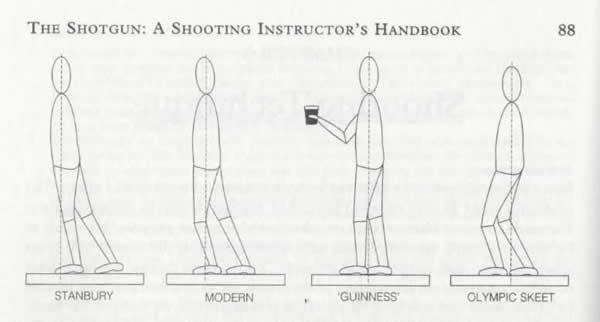 In order to find the correct shooting stance you must experiment. By all means read about the various techniques for perfecting the correct shooting stance but the only real way to find it for yourself is to get out there and shoot. Try different things. Your feet should not be set in blocks of concrete. You may find that you need to adjust your stance for specific situations. You should be trying to attain tension free state when pulling the trigger. You can’t always get into the ideal shooting stance, especially when there is no time to move the feet between a pair, in this case you should look to adopt a compromise position or a position favouring the harder target. Vast numbers of clays are missed by those who simply don’t bother to modify their technique and just try and shoot everything the same way and without adequate target assessment. Above all else KISS. No I don’t mean physically, I mean it in the business sense of ‘Keep It Simple’. This something all shooters but especially beginners must remember. Stand square to where you’re going to shoot. Now, take half a pace forward on to your left foot [for a right-hander]. Bring your weight onto your front foot. Try and keep your front shoulder over your front foot. Bring your front hip forward too so the ball of your front foot, your front hip, and your shoulder are all in a straight line. You are now in the correct shooting stance. Great help on making the perfect strance definatly helpful for beginners.